Amazon is a great place to unload books, CDs, DVDs, and games, but there’s so much more that you can sell here. Basically anything with a barcode can be listed on the site as long as Amazon recognizes it. I’ve sold many items here, including a VHS-to-DVD converter, water bottles, headphones, and tons of other gifts that I didn’t want but for which I had no receipt; it’s much better to have money in my pocket than clutter in my house. You can find almost anything you can think of on eBay. With so many users looking for all manner of “stuff,” it’s a safe bet that you’ll be able to unload whatever it is you have to offer. A good trick of this trade is to start the bidding as low as possible. This will help miscellaneous and low-value items sell quicker, but it will also encourage buyers of the higher-priced items to start bidding early. This newish site is an excellent way to sell an older smartphone or iPad so you can have money to put toward a newer model. ExchangeMyPhone accepts many popular brands, including iPhone, BlackBerry, Samsung, HTC, LG, Motorola, and Nokia, in various states of condition — even broken. Of course, you’ll get less cash for a broken phone than one that’s in pristine condition, but every little bit counts. Plus, it sure beats tossing the broken phone out with nothing to show for it. To put this in perspective, I entered in a used Apple iPhone 4 16G (AT&T) in good condition (some scratches, average use) with no water damage. In turn, I received a quote of $105. When sellers cash out, the service will e-mail a postage-paid shipping label or send a postage-paid padded envelope. Upon receipt and inspection at the warehouse, the seller is paid by their preferred method of cash or PayPal. You can sell lots of valuable items on Craigslist, but perhaps the most popular is furniture. Craigslist is perfect for getting rid of large, heavy furniture because the buyers are local; they’ll come to you and take it off your hands. The only fingers you’ll have to lift are the one that take the money. If you have an extra bedroom in your home and you’re in an area conducive to travel (although don’t brush your area off even if it’s not in the city; people travel everywhere for all kinds of reasons), consider listing it on Airbnb. My husband and I have listed our guest bedroom on the site for the past three years. We’ve met hundreds of incredible people from all over the world — and made a pretty penny in the process. Hands down this is the easiest, most fun way to earn a lot of money on a consistent basis. Are you crafty? Ever wanted to sell your creations but couldn’t find the marketplace? Enter Etsy, the most popular source to sell craft supplies and handmade and vintage wares. There are more than 30 categories in which to list your products, including bags and purses, candles, ceramics and pottery, dolls and miniatures, jewelry, paper goods (like greeting cards), quilts, and toys. Despite gift cards often being advertised as the gift that’s always the perfect fit, that’s hardly the case. Have you ever received a gift card that you didn’t want or need? I know I have; at a white elephant party a couple years ago, I received a gift card to a supermarket that didn’t have stores anywhere near my home. Instead of letting a gift card like that go to waste, you can try to recoup at least some of its value in cash by listing it for sale on Gift Card Granny. The site says that sellers can get up to 92% cash back for unwanted gift cards. Not too shabby for something you didn’t buy in the first place. Not all vehicles are eligible for a trade-in, but Car Daddy lets users to list their unwanted cars and trucks for sale for free. Each listing allows up to 35 photos (the more photos you have, the easier it will be to sell the vehicle), and buyers are local which increases your chances of signing over the title without hassle. Every season I clean out my closet and give away clothing that I don’t plan to wear to my friends or charity. But, to be honest, that’s a wasted money-making opportunity. Recycle Your Fashions has people like me in mind by accepting brand-name clothes (a list of acceptable brands is provided) in good condition that someone else may enjoy. As the site says, “For every person who is looking to sell items from their closet, there is a buyer out there who is looking for that exact item for the price you are looking to sell it for.” Totally true, and definitely worth a shot. Among the methods I’ve listed here to sell your stuff, Ex-Boyfriend Jewelry one might be my favorite. I’m sure there are other sites where users can sell their jewelry, but I particularly like this concept; it has a clever tongue-in-cheek appeal. The tag line is, “You don’t want it. He can’t have it back.” — to which I say, touché. There’s important information you need to know, though. First, it costs $1.99 to post an ad — which is a rather low fee when you consider the built-in catharsis. Second, you will be required to tell your story — and if it’s not about an ex, you won’t be allowed to participate. I can’t help but wonder, however — what in the world did the ex-boyfriend of the site’s creator do to make her so bitter? It’s as simple as it sounds — if you have books to sell, do it at Cash4Books.net. This site is particularly useful for finding college textbooks since a lot of its users are cash-strapped college students. What I like best about Ultimate Buy Back — where you can sell CDs, DVDs, and video games — is that there’s no guessing game involved. When you enter in the barcode, the site automatically provides you with the fee it’s willing to pay (no auction like on eBay and no waiting for the right buyer at your listed price like on Amazon). Once Ultimate Buy Back receives your titles in the mail, you’ll get paid. That’s money in your pocket in three simple steps. StubHub is the go-to resource when you have event tickets that you want to sell, such as if you can’t make the event or received the tickets as a gift but don’t want them. Those should be the only two reasons you’re selling your tickets, mind you. Don’t be that person who buys up all the seats during presale just to turn around and sell them to the public at a premium. That’s just rude, man. When you have a stack of Groupons and other daily deals like I do, you run the risk of the deals expiring before you have a chance to redeem them. If you’re cutting it close, consider listing your voucher on CoupRecoup in hopes of selling it to someone in your area who can put it to good use — and pay you for it. Win-win for both parties, in my opinion. 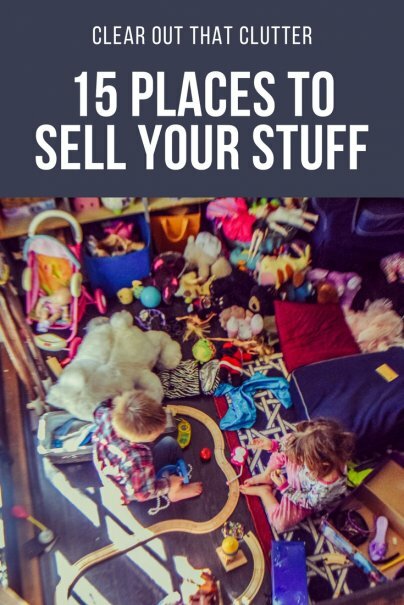 Even if you think that nobody wants what you have in your attic or garage — specifically, those knick-knacks and other items that don’t seem to have much value — think again. People will buy anything if the price is right — even those dust-covered chotchkies that it seems nobody in their right mind would spend a dime on (where do you think hoarders get all the stuff they have, y’all?). If you plan to have a yard or garage sale, however, be smart about what you put up for sale. I see so many people on those pawn-shop TV shows with an item they picked up for next to nothing from somebody’s driveway to discover upon appraisal that it’s worth big bucks. You don’t want to be the one kicking yourself for handing over a pot of gold disguised as a piece of junk. Have even more ways to sell your stuff? What sites or methods do you use to make money on items you don’t want? Let me know in the comments below. Getting in on or arranging a community yard sale can be a great spin on the regular yard sale -- the more stuff available, the more people you can probably attract. I love yard sales but I'm always so busy that I can't even think of setting one...At the same time I got a lot of unused stuff and I've started listing them online (to sell them eventually) and I came across this site unioncy.com where you can collect in just one place your personal belongings. I think it could fit your list here. I've bought so many of my college books from Cash4Books they're great. I've never heard of Gift Card Granny though it looks great. you can always use your groupon for the amount paid. if you pay 20 for 40 at a restaurant and it expires the expired groupon can still be used as a gift certificate for $20. Great List! Another awesome place to list is www.SargesList.com - it is a "Craigslist-type" of site specifically for Military. If you live near a base, you should definitely check it out for listing your stuff! Thanks for the tip, Carmen. I've never heard of Sarges List, but this sounds like an excellent resource! Why does no one ever mention Once Upon a Child? Winmark companies are great ways to make a little money on gently used items. Hi, Katie! Thanks for the comment. This isn't a place to sell stuff, but we use Paperback Swap and Swap A CD to get rid of books we don't want or need anymore and to clear out our CD collection. For each book or CD we swap, we get a credit to get a book or CD we really want. They are great sites! I haven't used Paperback Swap yet myself, but my very sweet mom put some books from my Amazon wish list on her Paperback Swap account -- one of the books I received was even brand new! Great list of e-sites. Ultimate Buy Back sounds interesting because I have a lot of used games and such. I'm thinking about starting up a small company in a garage called "we sell your crap on online," kind of like the store from the 40 year old virgin. Then I'll sell people's crap they don't want anymore on the internet, and make a commission off each item I sell. Is that a good idea? I can't find one that's already established in my city so I might be the first. Ummm that's called eBay....or craigslist....you are just selling it for them, like a consignment store. I sell my books at Powells.com. I put the ISBNs in the website, and they will tell me if they will take the book, and how much they will give me for it (either in trade or Paypal). Here's the best part...you pack up the books and they give you the postage label. So you aren't even paying for shipping! Promotes that if you don't use an item anymore, then why not sell it! Great for advertising your unused items locally. Hello, I had to close my business for women's purse. Do you have any website to recommend besides eBay or craigslist? I'd like to sell them by bulk as well. Thanks!!! There is also the new app tradr! It is totally free and connects you with local buyers and sellers. It is more interactive and supports local community! Here there is a new but excellent site to sell, buy, donate used goods. Try Varagesale. It's free, safe, user friendly and the best site of all. It's been 1 year since I sold my home and divorced. I have stuff galore and need to get rid of stuff that I don't need or can't use anymore. This Website is amazing, thank you! I need someone or more to come to my home & take the stuff away. I can't do that,I am on Oxygen.